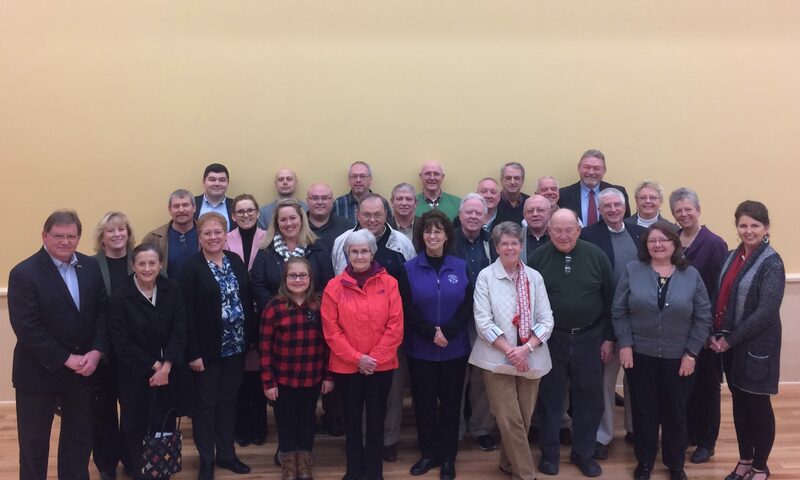 Forty representatives turned out for the 2nd Annual Licking Valley Adventures dinner at the Neal Welcome Center last week, up from 22 last year. Licking Valley Adventures is a (9) county group co-founded by Nicholas and Bourbon Counties to jointly promote Adventure Tourism and Economic Development to provide a healthy lifestyle and economy for the area. Tourism has a $13.7 billion impact on Kentucky. It is the third largest revenue generator for the state behind automotive and healthcare. It provides 186,204 jobs paying $3.1 billion in wagers and generating $1.43 billion in tax revenue for the state. The group enjoyed a great meal and got an update from co-Founder Tracy Pratt-Savage about all the group accomplished in 2016 and plans for the year ahead. Besides establishing a website and Facebook presence, the Small Town Fall Color Tour in October 2016 included Paris’ Peddle and Paddle Event. Carlisle also offered a bike ride around Lake Carnico – both led by Mike Galbraith, Licking Valley Adventures member and Urban/Transportation planner and avid cyclist. Other communities participated with Fall festivals, farmers markets, downtown historic tours, the Covered Bridge Tour in Fleming County and more. Galbraith will be leading the Long Term Planning committee in 2017 that will be working with all (9) counties to put together a Master Bike/Pedestrian Plan. The Water Committee will be working on identifying, promoting, and looking for additional river access points for canoeing and kayaking the Licking and Ohio Rivers, and Stoner and Hinkston Creek. The Events Committee is already working on Spring bike, hike, paddle, and other events we can promote. And efforts are underway to promote Economic Development in the Licking Valley area with listings of available land and buildings on StateBook.com. The group will be pursuing grant funding for bike/ped paths, additional sidewalks, help with planning and development of nature trails on a county by county basis as well as on a group basis. Blue Grass Area Development District is helping with grant writing, cycling transportation expertise and authored the LVA Website. Nicholas County Economic Development Director Tracy Pratt-Savage was elected “Director” of Licking Valley Adventures to help the group move towards 501C3 status with assistance from Nicholas County Attorney Dawn Curran Letcher, forming a formal board of directors, and to solicit donations and other forms of funding to be able to hire a part-time administrator. For more information, check the group out online at www.lickingvalleyadventures.org or like them on Facebook to keep abreast of upcoming events on Facebook @LVA Adventures. Licking Valley Adventures committee meets the third Wednesday of the month at the Carlisle-Nicholas County Economic Development offices at 11A, 2477 Concrete Road, Carlisle, KY 40311. The meeting is open to the public. 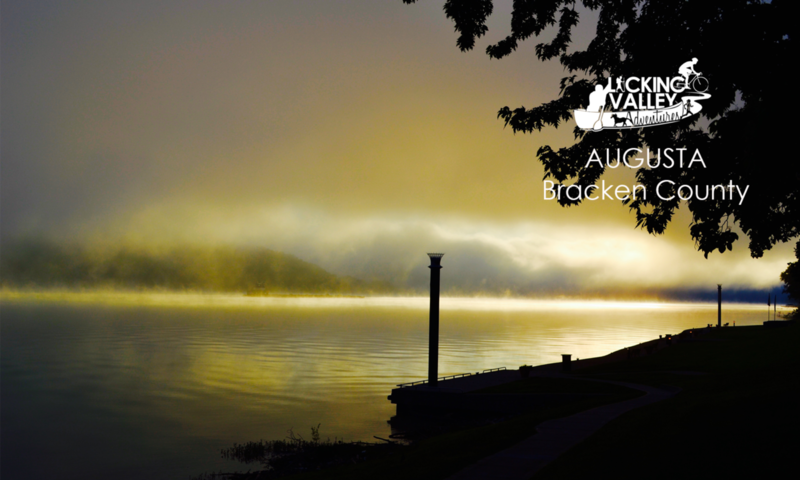 Bath county is one of (9) counties that make up the Licking Valley Adventures overage area. Judge Executive Bobby Rogers was one of 22 members who attended a recent evening monthly meeting where the group worked together to determine a Mission Statement for the group: to promote tourism and a healthy lifestyle through a regional network of adventure and historical tourism experiences promoting the uniqueness of our area of Kentucky. At the July 12th meeting the group decided to expand its mission statement to include “Adventures” of other kinds including: shopping, bourbon-winery- micro-brewery tours, historical and museums and covered bridge tours and anything else that people may consider an “Adventure” for them. The new mission statement will be updated to reflect that. Also decided at the lunch meeting held at the Fleming County Covered Bridge Museum was to move ahead on developing the LickingValleyAdventures.org website with the help of the Bluegrass Area Development District. Chris Chaney with Bluegrass ADD is a member of the group and is offering both professional and personal expertise. Chaney and the BG ADD team helped author a $15 Million dollar Tiger Grant that Licking Valley Adventures (LVA) is pursuing and will also be helping with TAP Grants and Fish and Wildlife grants to help develop more light craft boat access for the area rivers. Other counties attending included Fleming, Bourbon and Nicholas County. Flemingsburg Mayor Marty Voiers, Carlisle Mayor Larry Jolly and Cynthiana Mayor James Smith represented along with Nicholas county Judge Executive Mike Pryor. Crystal Ruark, Melanie Jones, Brenda Plummer, Claudia Clark, and Ginnny Reeves with Fleming County chamber of Commerce and Tourism, and Tracy Pratt-Savage Nicholas County Economic Development Director and Chamber President all turned out this month. The big pushes for the group now will focus on the county level. Each participating county including Bath, Fleming, Mason, Bracken, Pendleton, Harrison, Bourbon, Robertson and Nicholas will be asked to name a Representative to attend monthly meetings and an Administrator to update the Licking Valley Adventures Facebook Page. The goal is to make Licking Valley Adventures the “go-to” place for anyone living in the area or visiting to find out about all the great activities that are going on in the area. At the same time, each county will begin working on its individual events for the Fall Licking Valley Adventures kick off weekend of October 15 and 16. Each county will develop events for that weekend including cycling, hiking, walking, runs, equestrian and/or river events. Together the (9) Licking Valley Adventure counties will be promoting the weekend to bring awareness to the area and all it has to offer. The August meeting the 2nd Tuesday of the month at 11:30A will be held in Nicholas County. Interested citizens or groups are invited to attend. For more information about upcoming events in the (9) county area including the “Walking Dead Day” coming up August 6th downtown Cynthiana 9A – 6P check out the Licking Valley Adventures Facebook page. For fans of the TV series, creators and Cynthiana native Robert Kirkman and Tony Moore will be special guests. Hotels in neighboring communities as far away as northern Lexington and Georgetown are already booked up for the event that could draw as many as 20,000. The 2016 Bourbon County Secretariat Festival is on the move. This year’s 9th renewal will take place Sept. 16-18 in historic downtown Paris, Kentucky. Festival events will be located along scenic Main Street amidst the shops, amenities and small-town charm of this Central Kentucky township. 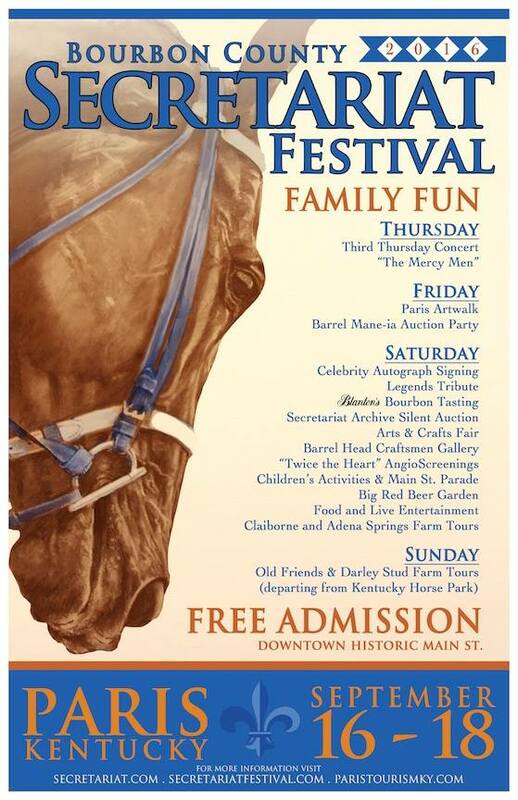 The Festival will feature many of the existing Secretariat fan favorite events including Claiborne Farm tours, celebrity autograph signing, Secretariat archives silent auction, Friday Paris Artwalk and Barrel Mane-ia Bourbon tasting, as well as a wide selection of food and entertainment. The new Main Street location lends itself to the addition of several new and exciting festivities and attractions including the Legends Tributes, Big Red Beer Garden, Festival Parade, Blanton’s Bourbon Tasting and Bill Nack Storytelling, Barrel Head Craftsmen Furnishing Gallery, “Twice the Heart” AngioScreening, with even more exciting activities to come! Mark your calendar for an exciting and fun weekend in Millersburg on September 9,10,11 ! The annual Chautauqua Day festivals will begin on Friday the 9th and conclude on Sunday the 11th. Chautauqua days will feature various craft artist, Mr. Simon Kenton telling his story, great local musicians and all of this will be complemented with excellent food vendors . There will be a kids area with crafts and games for the children , a quilt show at the 5th St., Café and a international film Festival at the Artcroft gallery on Main Street and much more! A full schedule will be posted soon and we hope you will come to Millersburg the weekend of September 9–11 for a fun family weekend and a little step back in time! TOUR DE PARIS: PEDAL & PADDLE! Mark your calendars for the first ever road and river group event, Sunday afternoon, Oct. 16. 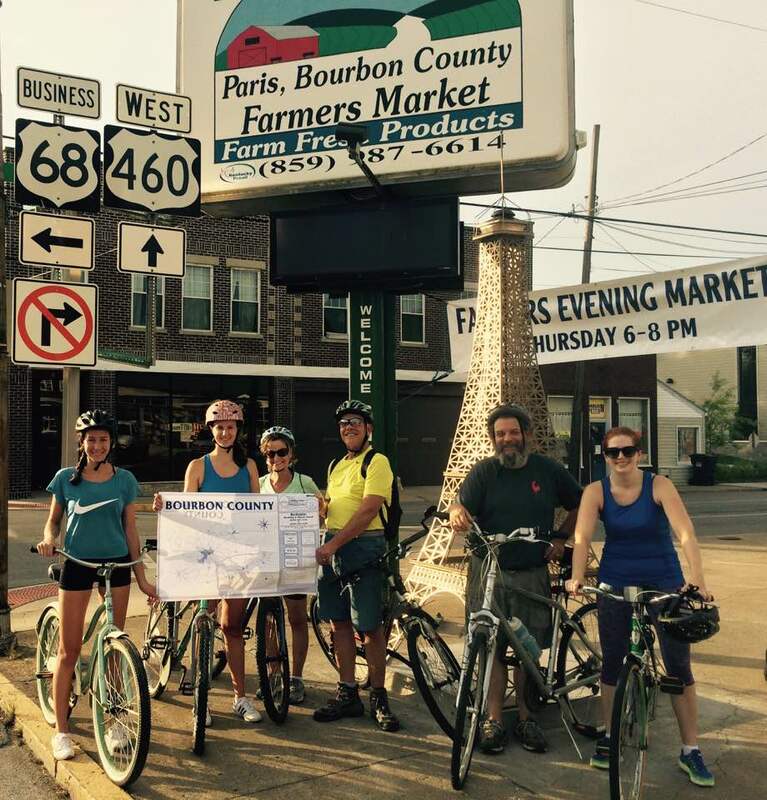 Sponsored by Paris-Bourbon County Tourism, Setter Ridge Outfitters and Rooster Brew, the event consists of an easy, five mile bike ride and an easy, two mile kayak/canoe float. Minimum age: 12. Don’t forget to cast your vote for Fleming County’s Goddard Covered Bridge. You may cast one vote every day for 4 weeks! So like, share & vote often. This is an excellent opportunity to showcase our very own covered bridge! 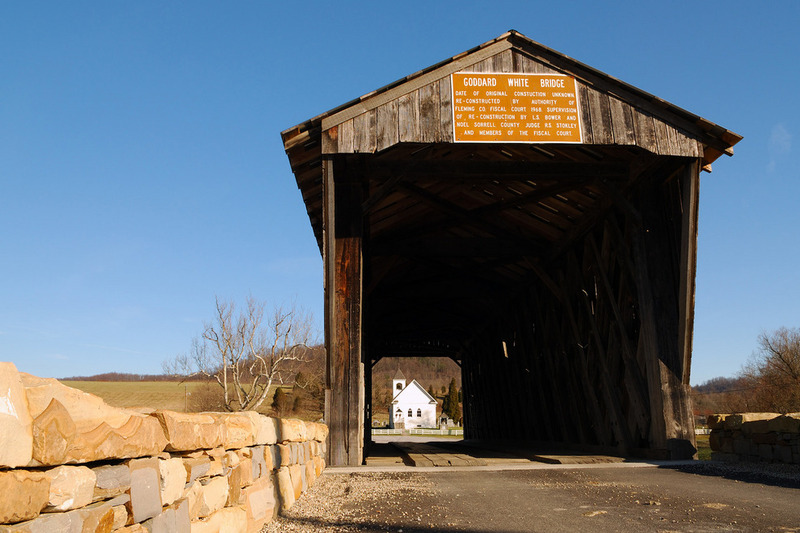 Built in 1864, the 63-foot Goddard Covered Bridge is the last remaining Town lattice-type bridge in Kentucky. When Highway 32 was rebuilt in 1932, the bridge was relocated about a mile north to its present location. From a certain viewpoint, you can see the white Goddard Methodist church through the bridge.